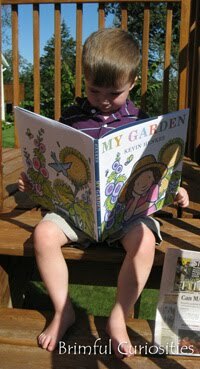 Under the Greenwillow: The Official Birthday Blog of Greenwillow Books featured the above photo of my son reading earlier this week. Isn't he cute sitting there reading? Kevin Henkes happens to be one of our very favorite authors. Find more of this week's Wordless Wednesday (or Wordful) posts at 5 Minutes for Mom or Parenting for Dummies. I remember those delightful, ever-so-popular, spiral-mesmerizing lollipops! I haven't had a sucker like that in years. It looks so yummy! Each week I pause and look at the HUGE spiral lolly pops at the grocery store in the bulk candy section - and for a brief moment I think how much my daughter would love to have one. Then, I snap back to reality and can only picture the sugar high, and I quickly move on! And, I love the picture of your son reading! We are all big readers in our house. I will have to check out some Kevin Henkes books. Your blog is beautiful! Can't wait to stop by more frequently and read some of those book reviews too. Thanks for the link! Wow, that is one huge sucker isn't it? Thanks for stopping by my blog. 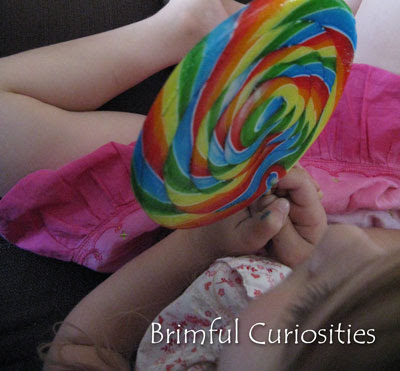 Any kid would be attracted to the colors of a sucker like that. Love the book reading photo!